I have had very few occasions to experience live and direct crucial moments in the history of a European country, except for those lived in my own country. But these days I have had the chance to follow first hand the heated debate that has taken place in the United Kingdom about whether to remain or leave the EU and the tsunami triggered by the final decision to leave Europe. The reasons for this outcome are multiple and complex and relate both to domestic and foreign politics, but I will refer to three major causes which in my opinion have determined this outcome. The first cause leads me to denounce the lack of political vision of all those who opposed the United Kingdom leaving the European Union but ingenuously accepted the “Brexit” political slogan without realising that, in fact, they were unconsciously legitimising the possibility that Britain actually left the EU. I include here all political officers, both European and British, who naïvely adopted “Brexit” as a campaign catchphrase. All of them were unable to set against “Brexit” another positive denomination which would mobilise British voters in favour of remaining in the EU. This inability to present the continuity in Europe in a positive way has also been burdened by the traditional euroscepticism regularly ingrained by most British politicians. It is very hard to excite people with the ongoing criticism and demonisation of Brussels and its institutions; even the European agreement on “Brexit” achieved by Cameron carried in it doubts and uncertainties about the true European self. The second cause leads me to speak about the emotional intensity of the political debate that has taken place around this topic. The British have gone through intense days compared by many to the critical days in the country’s history in which they had to take major decisions. The population of the United Kingdom has a sense of history and knows and feels responsibly when it is facing a major event. In the dialectic exchanges, there were abundant references to the experiences of the two world wars, and the patriotic feeling has been used especially by those advocating to leave the EU to recall old controversies, in particular the one that arose between Chamberlain’s policy of appeasement and Winston Churchill’s firmness and intransigence. Churchill’s imperial dreams and traditional isolationist attitudes have been taken up as siren songs from a past time to which they would like to go back, unaware of the many deep changes that have taken place in their own society and in the outside world. In this emotional area, advocates for Remain found themselves helpless and lacking any imaginative proposals. When it comes to passion and emotion, “Brexit” wins, arousing feelings and affective nostalgias that those who advocate for remaining in Europe are unable to counter with new horizons of glory and splendour for the country in new European episodes to come. The stars in the blue flag do not move people and Beethoven’s hymn of joy does not get to the heart of the British, but the “Union Jack” and “God Save the Queen” are still essential elements of the British self and feeling. The third cause that could have countered the elements favourable for “Brexit” advocates has not been conveniently explained and elaborated: the economic and social consequences of leaving the EU. We constantly hear that the British are realistic and pragmatic and that they take their decisions with an eye to ensuring their economic and social status. However, British political leaders have not been able to convince their voters about the negative impact that will be endured by all social classes when the country leaves the Union. Paradoxically, it is precisely the working classes and those who will be most affected by the lack of social protection when the network of European guarantees disappears that have adhered to “Brexit” without rationally considering their future. It is true that advocates for “Brexit” fallaciously introduced several obsessions and new spectres, among them, immigration. This is the major problem that will be increasingly present in the 21st-century European political debate. Forecasts by the IMF, the World Bank and major financial analysts have not made an impression on British citizens, proving the increasingly blatant rupture between the “middle class” and the “establishment”. The British either do not know or do not want to know that the United Kingdom, creator of the industrial revolution, does not longer have an industry, neither heavy, nor textile or automotive. The British seem to ignore that there are 13,000 European doctors taking care of them in their hospitals and that all of their dynamic economy is supported by a young and entrepreneurial European workforce. The British did not realise that by voting No to Europe, they may have opened the door to Scotland’s independence and to losing the gas of the North. The British preferred to ignore the possibility that this may reopen the issue with Northern Ireland, since Northern Ireland voted for remaining in Europe while the other citizens of the United Kingdom voted for leaving it. Lastly, the British believed that their main economic and financial support, the “City”, will continue being a centre that attracts foreign capitals and investments, without understanding that in those markets speculative trends and lack of trust shift with an extreme volatility. All these problems and facts have not been grasped by the United Kingdom voters and in the short and middle term will become the major challenges for the future UK government. But if these are the reasons and consequences of “Brexit” for the United Kingdom, what should concern us as Spaniards and Europeans is how to react to this new reality. The EU must, in my opinion, propose a new refoundation of Europe. 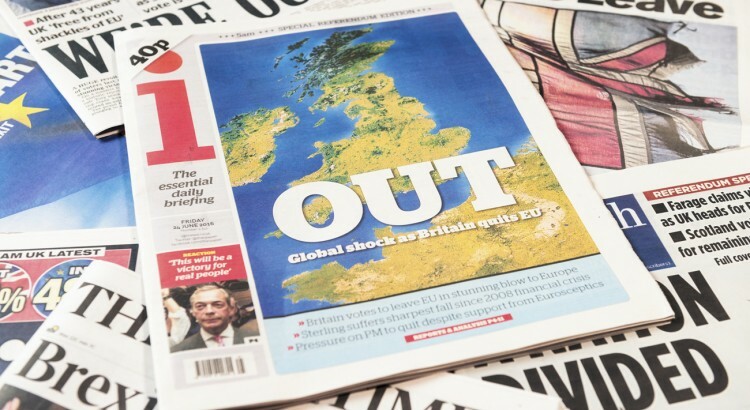 “Brexit” does not only mean that a member State will leave the Union under section 50 of the Lisbon Treaty, as if everything stayed the same, “business as usual”, as if nothing serious had happened. On the contrary, we must take this chance so that truly pro-Union countries with a deep calling for integration, now without the British cheque book and veto, without the “in and out” from the United Kingdom, can propose a new treaty in the Euro zone including a Parliament and specific fiscal, economic and budget standards, accompanied by a European army and a true European foreign policy led by a true Minister of Foreign Affairs of the Union. Finally, “Brexit” will have put an end to the europeisation process that was taking place in the United Kingdom. 64% of British youngsters between 18 and 24 years old voted for remaining and they still have 69 years ahead to live. The old ones, 58%, decided to leave, when they only have an average of 15 years to live. Europeans must keep on reaching out for the British youth so that they review the current decision, but it will be up to them to democratically stand for their cause. In any case, “Brexit” may be the start of a new phase in the United Kingdom. We wish them the best, but all seems to suggest that the Great Britain of the 19th and 20th centuries will slowly turn into a Small Britain, as some analysts say. As from today, we Europeans must take advantage of “Brexit” to urgently accelerate the construction process of a “great Europe” with maximum integration and willing to be an essential and major actor in the new world.